Crimson & Cream is a fantasy tale that focuses on 13-year-old twins Eadriel and Elvar, who have fallen on hard times and are desperately trying to unravel their tortured past and create a magic future. While following the familiar coming-of-age trope, the book is an engaging YA novel that will quickly win over lovers of that genre. Born to teachers at the revered school of magic at Dwim-Halloe, these twins seemed to have a wonderful future set for them: a privileged life, loving parents, reserved spots at the school of magic, and an endless supply of books to devour. But that brilliant future came crashing down the day the king outlawed magic in his realm. Not only outlawed it, but made it a crime for anyone to teach it. And soon, the king’s guards arrived at the twin’s front door, taking away their parents to imprisonment and death, and leaving them desperate, homeless orphans in a city that hated them. Thankfully, an orphan street gang takes the two in, renaming them Flotsam and Jetsam and teaching them how to eke out a living on the unforgiving streets. Thereafter, every night the twins scavenge and pilfer for their sustenance and profit before slinking off into the sewers at night with the other members of their gang to hide from the morning sun and the local authorities. And while this existence is far removed from their life before, the boys have readily accepted it and thrived in their new family. But things never remain the same – even in the sewer of human existence. And soon, one of their nightly forays finds Flotsam and Jetsam fleeing for their lives down an abandoned well and into the darkness beyond, where they encounter something that will change their lives forever! Well written and throughly edited by C.M. Skiera, Crimson & Cream is an adventure tale of daring escapes and desperate discoveries filled with interesting characters, evil villains, frightening monsters, and black magic. Yes, it is definitely a YA fantasy, targeted more toward the adolescent audience, but that merely means it is filled with more excitement, more fun, and more light-hearted escapades. So if you are a lover of fantasy YA, YA in general, magical adventures, or coming-of-age tales, then this is a novel you should definitely pick up. 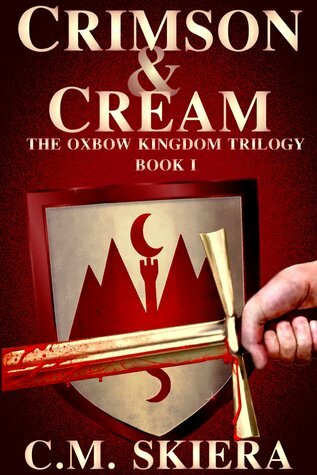 Buy Crimson & Cream (The Oxbow Kingdom Trilogy Book 1) at Amazon. This entry was posted in 3 Stars, Fantasy, Low, Self-Published and tagged C.M. Skiera, crimson & cream, fantasy YA novel, indie fantasy YA books. Bookmark the permalink.